1Add the olive oil to a large saucepan on a medium heat. Fry the leeks and garlic for 2 minutes, to soften. 2Add the mushrooms, herbs, salt and pepper and stir for a minute. Place the lid on top and cook for 8 minutes. 3Meanwhile, in a small saucepan, melt the dairy-free butter on medium heat. Add the flour and stir until combined. Slowly add in the milk, a tablespoon at a time and whisk, until you have a smooth thick mixture. Stir in the nutmeg and season with salt and pepper. 4Combine the cooked leeks and mushrooms with the sauce and leave to cool completely. 5Make sure your puff pastry is at room temperature (if using frozen, leave at room temperature overnight) and preheat the oven to 200C. 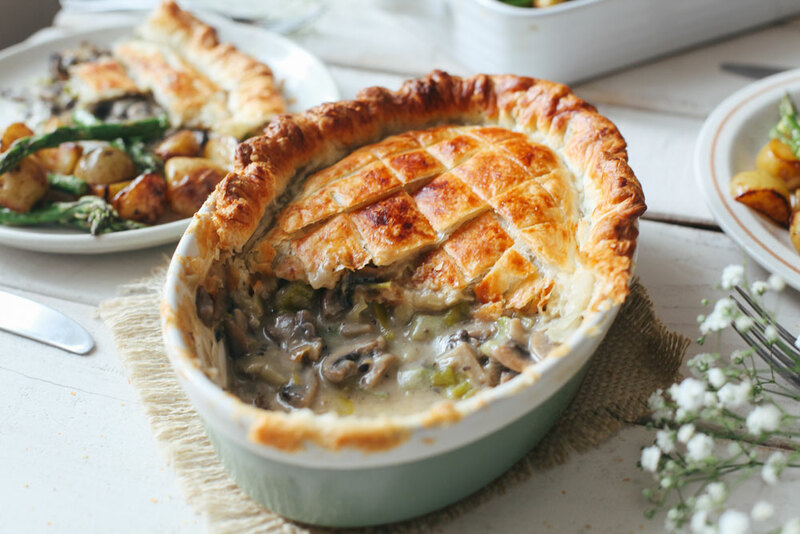 6Add the leek and mushroom mixture to a pie dish and top with the puff pastry, cutting off any excess pastry around the edges. 7Crimp the edges using a fork and score a criss-cross pattern on the top with a sharp knife. Finally, dip a pastry brush in a little dairy-free milk and brush the top of the pie, to help it brown. 8Cook for 25 minutes until golden brown. Serve straight away.